Atomic Content is where you can write & edit any form of written content. Atomic Reach provides feedback based on the length, content, emotion, and title (when applicable) of your document, giving you personalized suggestions to improve your writing. Edit a draft and polish it for publishing, making sure your readability matches your Target and your article score has hit your Atomic Score. Step 1. Load the draft you are editing either by copying the content directly into the editor, copying the content with code into the Source Code box along the editor bar, or by loading a draft. Tip: Make sure you save any existing progress if you'd like to resume what you are currently working on. Step 2. Now take a look at the bottom bar, this is where you control your editing options and see your workflow. Tip: Depending on the document type of your draft, your bottom bar may not include as many options as shown here. Step 3. Set your Target, picking between our 5 readability levels. Tip: by default, the Target is set to your best readability level based on the Recommendations module. For more information on readability levels, check out our article on readability. Step 4. Begin editing by turning and tweaking each editing measure. Step 5. To ensure your article is at its best possible state, make sure your readability matches your Target and your article score has hit your Atomic Score. Tip: The Atomic Score is for Article/Blog documents only. The goal of the Atomic Reach editing process is to have the readability of your document match your Target and have your article score reach your Atomic Score in the quickest way possible. Step 1. After loading the document, hit the Score button on the bottom right. Step 1. Turn on the Grammar measure and fix any spelling and grammar issues you have. Step 2. Turn on Length and break up any long sentences and paragraphs you have. Long sentences and paragraphs affect how easily your document is read by others. Step 3. Turn on Readability and click on highlighted words to see suggested word replacements that would help you match each paragraph's readability to your selected Target. Tip: you do not have to change every paragraph's readability to match your Target, but the more paragraphs matching your Target readability, the higher your article score will be. Step 4. Turn on Emotion and make some choice replacements to tune the emotion of your article. Tip: think of the Emotion measure as polish that turns a good article into a great article, it's best used to make a few choice adjustments. Step 5. Turn on Links and make sure you have no broken or slow links in you article. Step 6. If applicable, switch to the Title tab on the right feedback bar and try to incorporate some of the suggested title characteristics that lead to better engagement. Step 7. 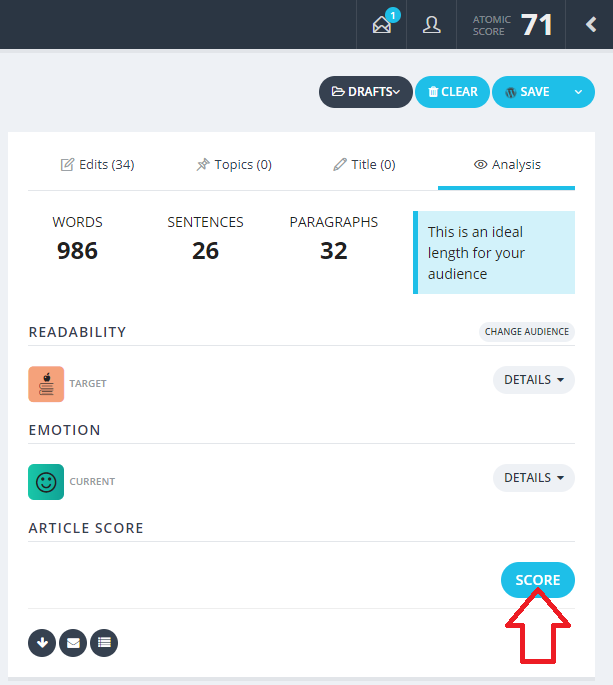 Switch to the Analysis tab on the right feedback bar and check if your article readability matches your Target and if you have reached your Atomic Score. Tip: Depending on the document type of your draft, your Analysis tab may include slightly different measures. Step 8. If you have matched both your readability and your score, then your article is ready for publishing. Otherwise, try getting a few more paragraph matching your readability, making some more title changes, and tweaking a few of the other measures. If you have any questions, feature requests, or would like a demo of our Atomic Content module, please reach out to support@atomicreach.com or submit a ticket via the Submit a request button at the top of the page and we'd be happy to help you.